Red line demolition and sorting grapples have been designed for demolition and recycling applications. Red grapples are installed in the place of excavator’s bucket. Their design has been completed according to customer’s needs in order to acquire light but robust structure and powerful and efficient prodcutivity. Due to its robust structure they are well built for primary demolition of targets made of brick or wood. It can manage other materials as well. Recycling applications require strickt and efficient separating. Typical application is recycling plant and there grapples are used to downsize and load the material fast and efficient. Yellow GR demolition and sorting grapples are suitable for these applications. Options for rock handling, clamshell and many more. Red G demolition and sorting grapples are without rotation. Without rotation the grapple is suitable for rotating tilt installation. Green attachments recommend our rotation always when the application is demolition or other demanding heavy duty job. Grapples are designed with flange which allows the customer to change adapter easily. Green Attachments provides different adapters when needed. Red demolition and sorting grapples are often used in recycling plants because of they are installed to tilt rotators and manouverability is extremely good. Also demolition applications are suitable and even easier to use. All demolition and sorting grapple models have 2 jaw synchronizing bars to ensure strickt movement of jaws. The demolition and sorting grapple range consists of ten models and many jaw options for 1 - 45 tonne excavators (2 200 – 100 000 lb). - Selector grabs have changeable bronze bushings and they have been over sized in order to increase life time. - Wear resistant edge plates are bolt mounted and easily reversible. - Syncronising of jaws have been carried out by twin syncronizing bars. They enable reliability and allow strickt movement. - Big cylinders ensure huge power, needed especially in demolition applications. 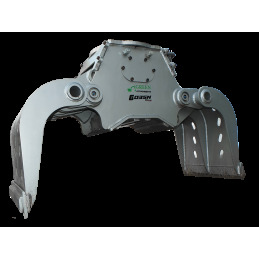 Red demolition and sorting grapples are equipped with plate reinforced jaws as standard when the grapple is more suitable for recycling applications. Loose material does not stick between ribs so easily.